Gorgeous Copper Wire -Work Necklace! 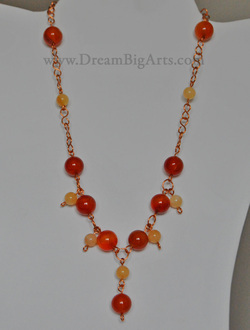 "Autumn" - a statement in carnelian, yellow jade and hand-made copper wire chain. A compliment to your clothes in any season, really, but inspired by the gorgeous colors of my favorite season. This is a one-of-a-kind piece. Wear it happily!